From traditional Disaster Recovery (DR) to Disaster Recovery as a Service (DRaaS), disaster recovery services make up a comprehensive approach to protect your business from downtime. Easily add a new DR site with Green House Data micronode technology, enabling rapid recovery from cloud sites across the country. Green House Data pairs IT business continuity systems with geographically diverse physical and cloud data centers to keep your business infrastructure operational during and after system outages. Whether you need a completely custom solution or you would like to use one of our disaster recovery templates, we can meet your requirements for security, compliance, recovery points, and recovery time. Cost-effective disaster recovery solutions securely replicate your data and establish recovery points. 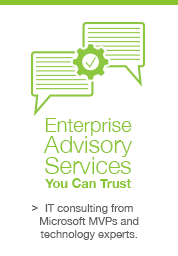 Modern DR applications complete replication in minutes vs hours with traditional methods. When an outage occurs, simply power up servers populated with your business data and get back to work. Prioritize recovery times by critical need, whether entire systems, databases or even single applications. Configure failover to and from physical hardware, VMware virtual servers, the gBlock Cloud, and even public hyperscale cloud like Azure. 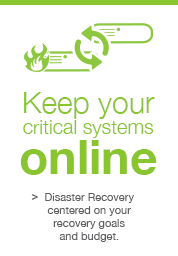 Whether you need help with just one piece of your disaster recovery plan, like backing up data, or assistance creating a complete plan including a recovery point objective (RPO) and recovery time objective (RTO), Green House Data can help. Our team works within your specified recovery service levels (RSLs) to keep the cost of your disaster recovery services low and get critical applications up and running as quickly as possible. 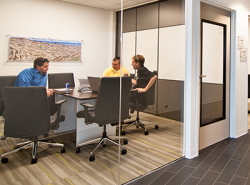 If you don’t already have an RSL in place, we can work with your organization to develop one. 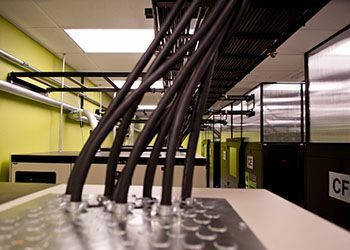 Green House Data operates data centers across the nation in some of the safest areas of the country. 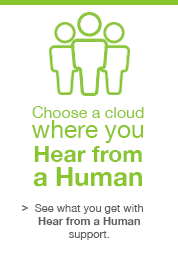 You can move your systems seamlessly between sites, whether you choose colocated backups or cloud disaster recovery. Choose a location for the efficiency of infrastructure near your business operations or the security of a site hundreds - or even thousands - of miles away. 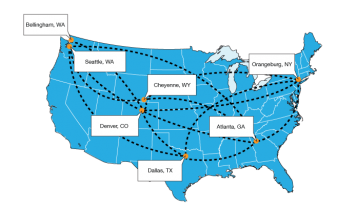 Green House Data's disaster recovery data centers in Seattle, Bellingham, and Cheyenne include work-recovery spaces where your employees can set up shop and keep your business running, even if your primary work site is rendered unusable due to an unforeseen disaster. Leave monitoring and management of your DR environment, backup images, and other aspects to us. We design, implement, and test your recovery solutions. After the DRaaS implementation is completed, Green House Data will create and provide the customer with a standard DR Runbook, including all of the information needed to perform a test or live failover, do basic troubleshooting tasks, and how to engage with Green House Data in the event of a failover or with general questions. 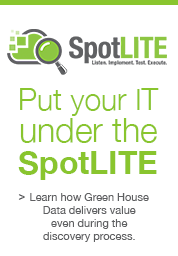 Whatever your IT infrastructure platform, you can backup and recover with disaster recovery from Green House Data. Send data to/from your physical servers, VMware virtualized servers, the gBlock Cloud, and even public hyperscale cloud providers like Azure. A basic infrastructure setup including connectivity and power, but not always including the necessary equipment to restore prompt operations after a disaster event. With a cold site, you will also provide and install your own equipment. More infrastructure than a cold site, but on a smaller scale than a hot site. A warm site has the hardware and connectivity already built in, and requires less recovery time than a cold site, but is still not a quick as a hot site. This solution includes all the necessary equipment for your business operations to resume as quickly as possible after a disaster event. It's considered a near replica of the usual business environment except for the location, and is operated by Green House Data. A continuously available solution that focuses more on uptime rather than simple recovery. It consists of a complete network of independent processing nodes with access to replicated databases allowing each node connection to a single application. If an issue arises in one location, the application can continue to perform in another.